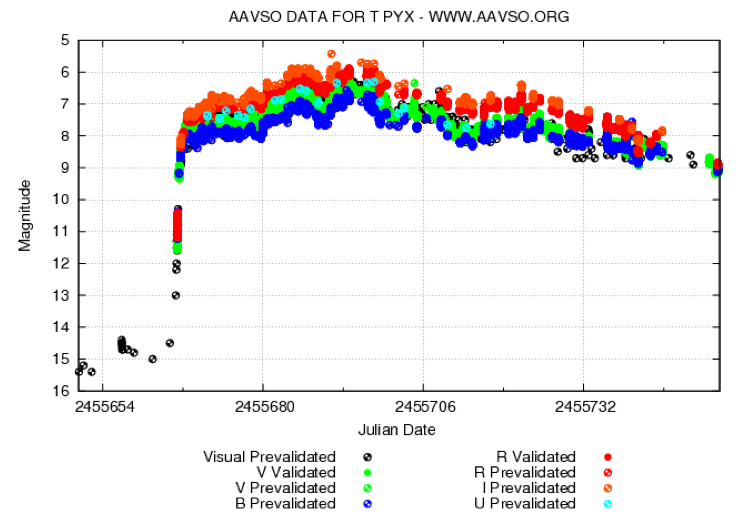 "I request that the AAVSO help with a campaign of fast photometry for the current eruption of T Pyx. The goal is be to get nearly-fulltime coverage of T Pyx with time resolution of minutes throughout the entire eruption up until T Pyx is lost behind the Sun around the start of August. This will require many observers, widely spaced around the world, each taking long runs of CCD images. The eruption takes roughly 9 months to go back to quiescence, but we will only go from now until the end of July (3.5 months) when T Pyx is lost behind the Sun. "By preference, use the COMPARISON star (AAVSO="93") for all the differential photometry, as it will have nearly the same colors as T Pyx. Use the other backup comparison stars only if you have troubles with field size, saturation, or SNR problems. At a declination of -32°, T Pyx can be usefully observed from the northern hemisphere, even though the time series runs will be longer each night from the southern hemisphere. With the bright stars and differential photometry, T Pyx can be followed down low on the horizon. "T Pyx is only one of ten known recurrent novae (RNe) in our own Milky Way galaxy. It has erupted in 1890, 1902, 1920, 1944, and 1967. (T Pyx has a long eruption, lasting at least 3/4 of a year, and it has been very heavily monitored every year since before the 1890 eruption, so we certainly are not missing any eruptions in this time interval.) T Pyx is the only recurrent nova with a shell (out to ~10" diameter), and this was seen to slowly expand from a normal (non-RN) eruption in 1866±5. SInce 1890, the quiescent magnitude of T Pyx has secularly faded from B = 13.8 mag to B = 15.7 mag from 1890 to 2010. This fading implies that the accretion rate has been falling off rapidly, explaining the lengthening inter-eruption time intervals. Judging from the 1967 eruption light curve, the current eruption light curve will stall out of its rise at around V=8 around 15 April, slowly rise to a peak near V=6.4 around 20 May, slowly fade to V=10 by middle August, then have a sudden drop by two magnitudes over the next 20 days (with drop being invisible due to the Sun). The 1967 eruption did show fast intra-night variations, but the old data does not have the time resolution to tell what is going on. "Recurrent novae must have white dwarfs near the Chandrasekhar mass and the accretion onto the white dwarf must be very high, so at first look it seems that they will soon reach the limit and explode as a Type Ia supernova. As such, RNe are one of the best candidate systems for being the progenitor of Type Ia supernovae. This progenitor problem is a long standing sore mystery that has now vaulted to even higher importance due to the need to know the evolution of SN brightnesses so as to make them precision tools for cosmology. Indeed, in last year's Decadal Survey, the National Academy of Sciences identified the progenitor problem one of the four most important problems in all astronomy. T Pyx is the prototype RN, and the only readily observable RN with a short orbital period (1.82 hours). As such, T Pyx becomes the lynchpin of many arguments and discussions for the progenitor problem. The work on this eruption will largely be aimed at testing whether T Pyx will become a Type Ia supernova. "Most novae have at least a sketchy light curve, and around 100 old novae have well observed light curves throughout most of the eruption (almost all of this data was from amateurs), but only one nova has large amounts of fast photometry. This exception is the recurrent nova U Sco, which erupted in 2010. For this, I organized a large worldwide collaboration of (mostly amateur) observers, and we measured 37,000 magnitudes, keeping watch on U Sco every 2.6 minutes on average for the entire 68 days of its full eruption. This is orders of magnitude better than for any other eruption ever. With this awesome data set, we discovered two completely new phenomena: the fast flares just before the plateau (of unknown origin) and the deep optical dips around the end of the plateau (caused by raised rims on the forming accretion disk). With two types of new phenomena discovered for the first nova examined with ample fast photometry, who knows what more will be discovered for the second very-well-observed nova. "I envision a repeat of the wildly successful U Sco worldwide collaboration of astronomers, so that we can get very detailed light curves of T Pyx and all its expected-complicated variations throughout the eruption. The goal is to follow all the big and subtle variations in exquisite detail so that we can understand their causes. This campaign will take the efforts of many people for long time intervals on many nights. As with the several huge data-rich papers from the U Sco eruption, all contributing observers will be included as authors of the resulting papers. The T Pyx campaign is to have all our work contribute to a whole that is wonderous and largely new and addressing the biggest issues in astronomy." Please join in this exciting and critically important campaign as best as your equipment, location, and schedule permit. This is fundamental science, and you can play a vital role in it! Be sure to use the latest chart (don't use the old one in your files), as there have been sequence changes, and use the comparison star(s) indicated above by Dr. Schaefer. 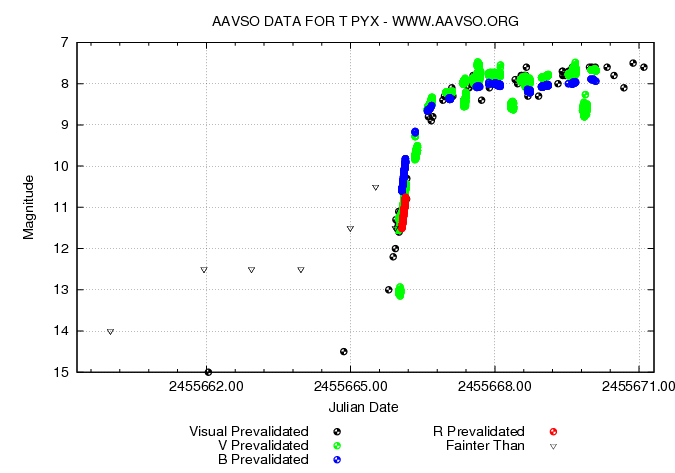 Please report observations promptly using WebObs to the AAVSO International Database as "T PYX". This campaign is referenced on the AAVSO Observing Campaigns page (http://www.aavso.org/observing-campaigns). This campaign announcement was prepared by Elizabeth O. Waagen. T Pyx has been slowly rising for the last few days after a rapid rise from m(vis)=14.5 up to 9.0 in one day, and a slower rise to its current brightness (just above 8.0) over four days. T Pyx is being followed by a number of people and groups around the world. We will post links to interesting sites as we hear about them. 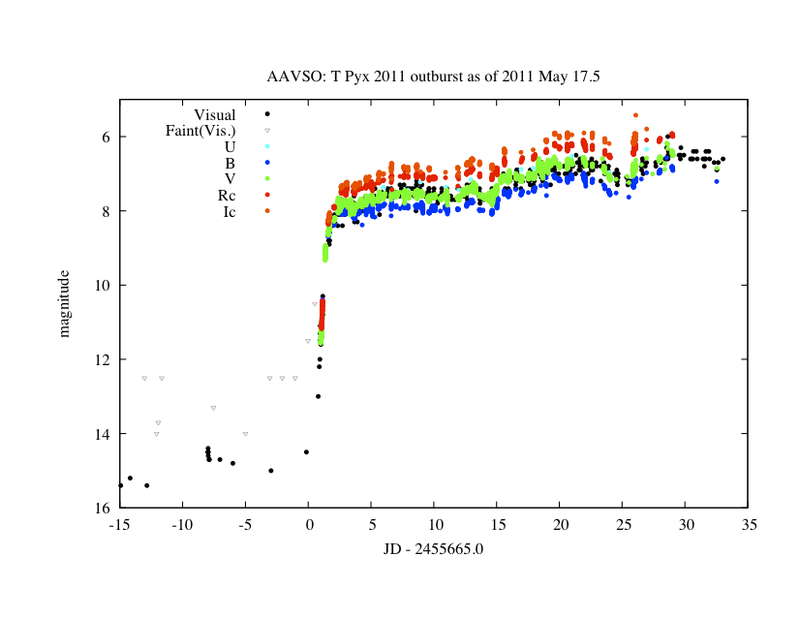 T Pyx continues to brighten, exhibiting a slow, undulating rise from its initial outburst to V=8.0 around 2011 April 15. As of 2011 May 17, it's now near m(visual) = 7.5, having brightened above 7.0 a few days ago. Observations of this nova are still encouraged! Please follow it for as long as possible for the remainder of its observing season. Having reached its peak brightness of m(visual)=6.4/m(V)=6.378 on May 12, T Pyx has begun to decline while continuing to undulate, reaching m(V) = 9.559 on July 17, 2011. Please follow T Pyx for as long as possible for the remainder of its observing season. Although the campaign itself will finish when the observing season is over, please resume observing T Pyx when it becomes observable again. The outburst will not have concluded by then, so observations will continue to be very valuable.